I really like penguins. I don't know quite what it is about penguins that makes my heart melt... they are just so lovable. The highlight of field trips to the New England Aquarium as a kid was always the penguins right at the front of the entrance. I know at least one other Boston Handmade member appreciates penguins, too... Penguin Love Press is a new addition to the group and features great journals and note cards. This coin bank is a caricature of a king penguin. Made of speckled stoneware clay and glazed in black and white, he wears a pengrin which implies how enamoured he is with his lot in life. I think this might give me the push I need to try needle felting. This kit has step by step instructions including photographs for each step. 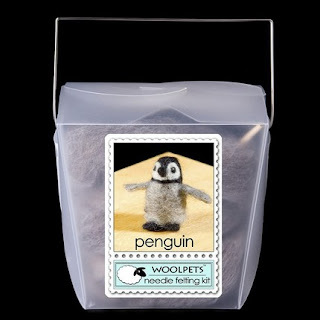 There is enough wool roving in the kit for one large or two small penguins! 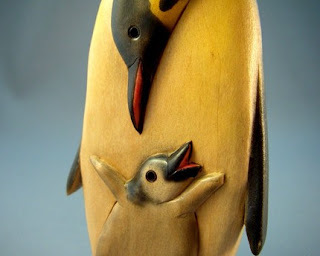 This one is my favorite... a precious hand carved wood figurine. 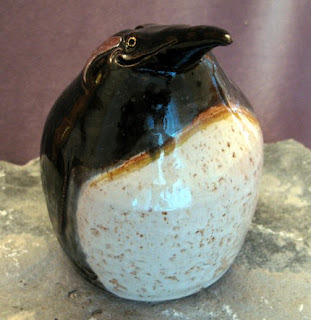 This would be perfect to go with my marble penguin at home! Perhaps someday it can be added to my collection. What themed items do you look for on Etsy? I love penguins too!! Those items are great, thanks for finding them!